I absolutely LOVE decorating. It is a major creative outlet for me. It gives me warm fuzzies and makes me happy when I decorate on the cheap. Today, I want to give you a little glimpse at a few areas of my house that are the main focal points of decor in my home. 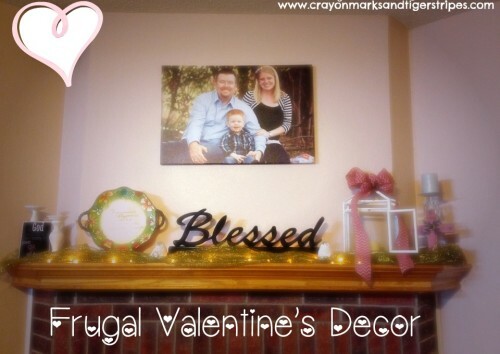 I want to leave you inspired to go on your own treasure hunt for frugal decorating! The first thing you see when you walk into our house is the mantle. 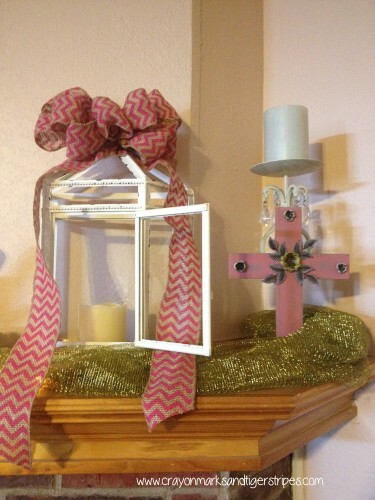 Everything on the mantle is inexpensive and several of the items are used year round. 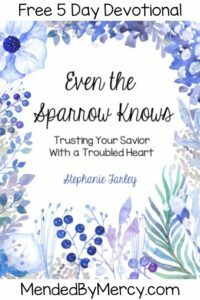 I hope that this post will inspire you to look at inexpensive items in a new light! Let’s take a closer look at the mantle. I got these candlesticks at an antique store for $6!!! I have LED candles that usually sit up there, but they are being replaced at the moment since they decided to stop working. The bible verse is something Dr. Smartypants and I actually made for Christmas gifts this year (and of course, I needed one!) It is simply a painted piece of plywood with a printable from pinterest modge podged on it. And the ribbon on the mantle was about $5. 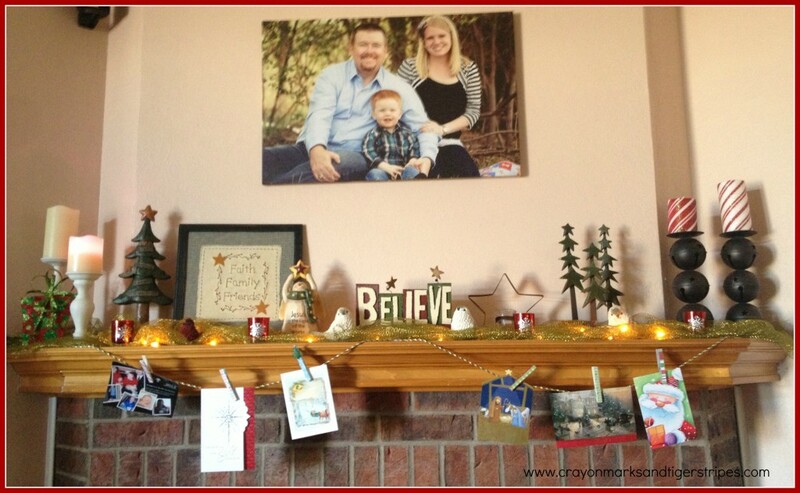 I used it for Christmas decor…check it out. See how the green ribbon went from Valentinesy (yes thats a word) to Christmasy (also a word.) Pretty awesome, eh. Oh, and there are those awesome led candles that quit working! 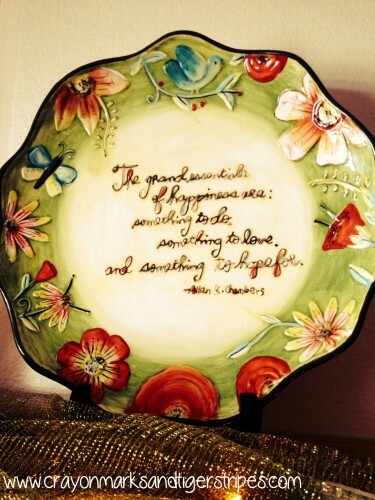 Continuing on with the closer look at the Valentine’s mantle…I got this gorgeous decorative plate at a little shop in Missouri. It was originally $14. It had some scratches on it that you can’t even see and was on sale for $5. Score!!! At that same shop, I got this cute glass cage for $12. I broke the glass on the front door (I was NOT happy about that! ), but it still works great! I love items like this because you can toss a ribbon on it or put a seasonal item in it to change it up for every holiday. I made the ribbon at MOPS (Mother of Preschoolers) at church. It was so fun learning to make bows!! I can’t remember where I got the cross, but I know I didn’t pay much for it cuz I only decorate on the cheap 😉 And that candle holder, $3 at Savers. For real! Let’s take a look at another place in the living room that your eyes instantly go to when you walk through my door. 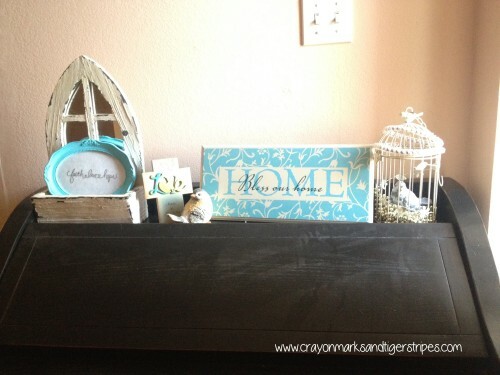 The piano is one of my favorite spots in my house to decorate. I’m all about things being asymetrical. I love that look! So let’s talk about this space. Those shutters? $12 at an antique store. I used picmonkey to put a bible verse on a photo that I printed at home and put in a frame that was half off at Hobby Lobby. The candle? Christmas gift. The Faith plaque? 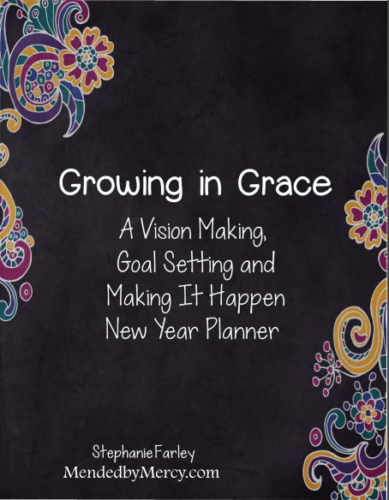 75% off at Family Christian Store (about $4). The mirror? $3. 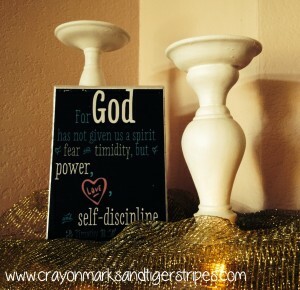 The yellow bible verse plaque- another homemade plywood craft. Upon closer look, you can see I sort of tossed a whole bunch of stuff in this old victorian tray, and can I say? I love it! 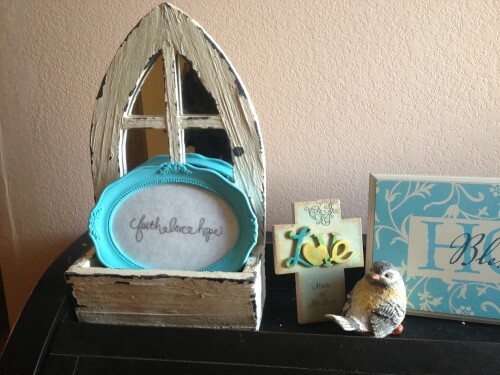 The birdhouse is from Hobby Lobby that I got for 50% off ($6). The heart pillows and cherish pillow ($9 total), the God is Love heart ($5) and the bead necklaces are all from the same antique store (Uniques and Antiques <—LOVE THAT PLACE) . My favorite favorite part of the piano is my holiday tree. This precious tree was given to me by my Grandma Honey (she’s always called me honey, hence her name!) My Grandma Honey is a decorating goddess and I have learned so much from her. She is also the one that bought me these Vera Bradley ornaments (75% off baby!). I am somewhat obsessed with Vera. 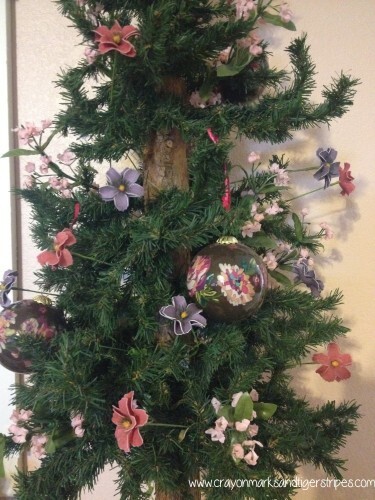 To decorate the tree for Valentine’s, I bought these flowers from Hobby Lobby (once again 50% off) and cut them into pieces so that I have the individual flowers sticking out. It is so pretty and I absolutely love it. 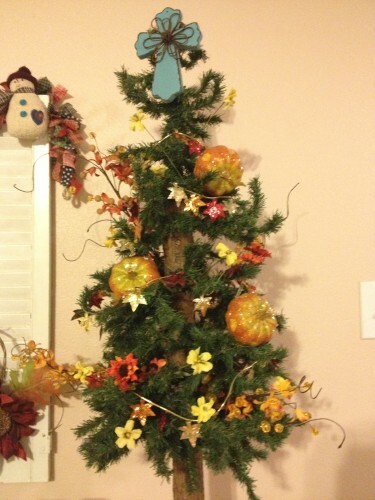 Here’s that same tree decorated for fall. Moving on, I have a little desk that sits in my foyer. The little window sill mirror was $8 from the antique store. Much like the glass cage on the mantle, it gets something new put inside it every holiday. The love plaque is from Family Christian Store (75% off). I can’t remember where I got the Bless Our Home, but it sure is pretty. I love that little Faith Love Hope frame. I got the frame for $3 from Savers and painted it! ..to this! I took the glass out, put scrapbooking paper on the backing and the Faith Hope Love sticker. Walaah. Cute frame decor to match my Bless This Home sign. 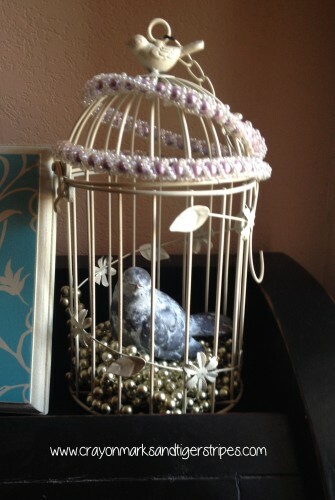 I got this little birdcage from Savers for $3. It came with the cute little bird. I tossed some old beads in it and on top and there ya go, cuteness. Lastly, my front door has this beauty on it. 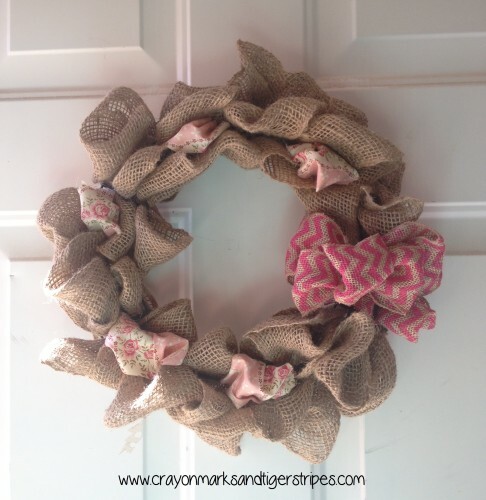 A wire wreath with burlap woven into it, a burlap ribbon and little pieces of fabric tucked into it. Shop antique stores, Salvation Army, Goodwill, Savers. Any kind of discount store. Look at the item and ask yourself if you can give it a makeover. Decide what your price limits are and stick to them. Always look for a deal! Look at items that you would usually throw away (ragu bottles, wine bottles) and figure out if there is something you can do with them. 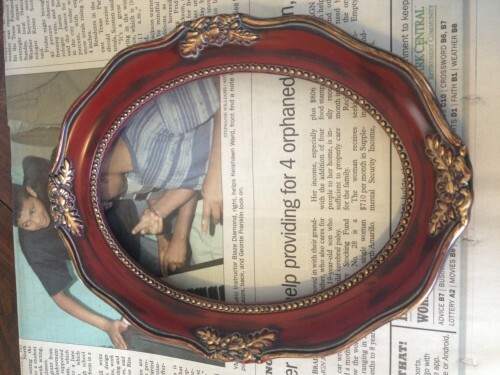 Trash can often be transformed into a treasure! I hope that this little glimpse into my home has inspired you! Are you a decorator? Do you get warm fuzzies crafting things or finding decor on the cheap to make your home lovely? 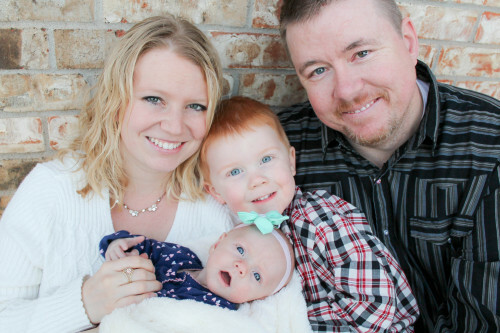 Valentine’s Day Mother of All Meltdowns Giveaway! Thank you! I love decorating on the cheap 🙂 It’s fun and frugal! I love how you incorporated a little bit of something in many different places. I’m horrible at decorating. I usually end up putting a few things in the main room. Thanks for the tips – I’ll have to remember them for next year. These ideas are gorgeous! 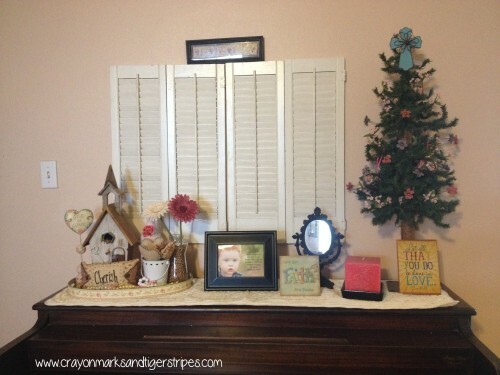 I love how you painted the frame and organized various pieces on a tray. Now that’s something I can do. You actually make me think that I can decorate. 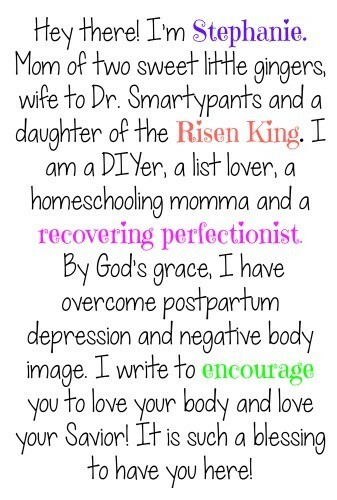 LOL Thanks for the inspiration! You so can! We worry about making it look to perfect, but asymmetrical/just kind of tossing and trying stuff together (like my tray) is what I find to be the cutest! What a beautiful mantel! I love cheap & thrifty finds. There is something so exciting about the hunt and pulling together a look that’s unique for far less money. It seriously makes me happy! 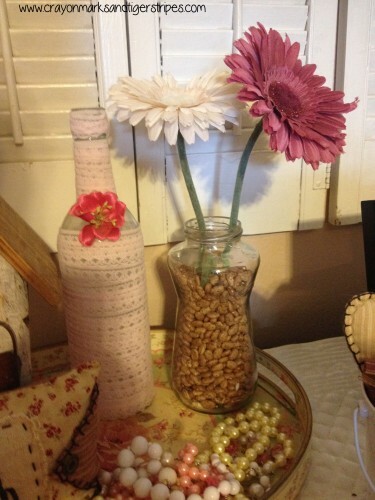 I love frugal decorating!!! Super cute! 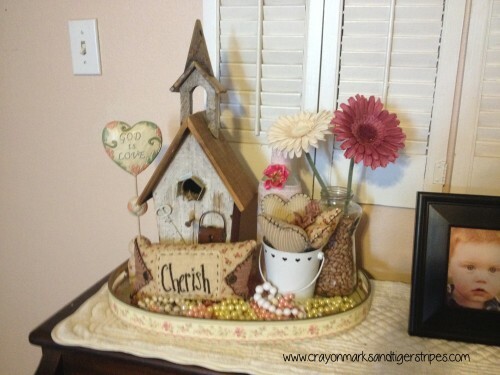 I loooove birds and birdhouses and gerber daisies! I have tons of family in Texas and I love me some wine as well 🙂 Instant bond for sure! Hi, I’m stopping by via the STIS round-up. 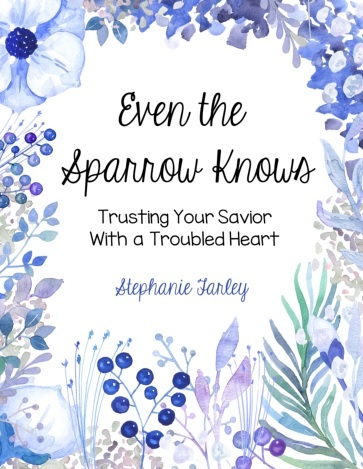 The first thing I saw was your post on Proverbs 3:5-6 – my all-time favorite verse! Cute Valentines ideas too! Have a great week!